Andres Löh. will be speaking. Starts at 9:00 AM. Following up on the Haskell eXchange, we will hold a two-day Haskell Hackathon at Facebook. Everyone is welcome, beginners and experts alike, and not just participants at the Haskell eXchange, but everyone who would like to participate in a two-day coding festival. 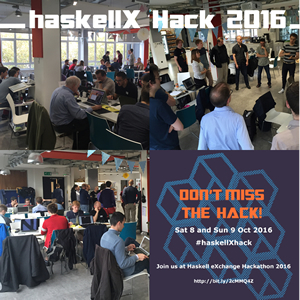 Join us at the HaskellX Hack 2016 on October 8th and 9th 2016! Unlike many other Haskell Hackathons, this one will have a theme: We will work on improving the Haskell infrastructure, and in particular Cabal and Hackage. This means that we specifically invite people who have worked on these projects already or would like to get involved. We will try to organize some ad-hoc talks and presentations to help newcomers navigate the existing codebase and to highlight interesting problems and issues to work on. If you want to come along, please register above, so we know you are coming and can send you joining instructions to the venue (this year the hack will be at Facebook). More info on Haskell eXchange can be found here. We are delighted to welcome you to the event and appreciate you as an integral part of our community whose contributions are invaluable. Our Code of Conduct is a guideline and promise to all members of our community.